SMU Libraries is conducting the first comprehensive campus-wide survey since 2011, in collaboration with OIT. The survey opened via email invitation on Thursday February 14th and will run until Monday February 25th. All Faculty, Staff, and Graduate Students, as well as 2nd and 3rd year Undergraduate students have been invited to participate. 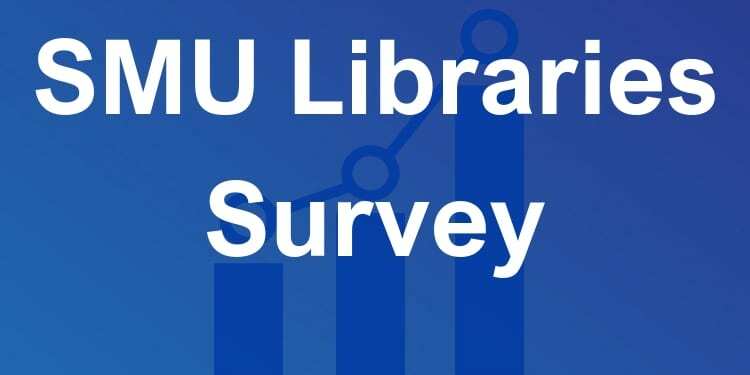 The general purpose of the survey is to understand how faculty, students, and staff use the SMU libraries, and how their academic and research goals might be better supported by library and related technology services. This endeavor is in support of SMU strategic goals aimed at advancing the overall academic quality to the level of a premier research and teaching university with global impact. Results from the survey will be available near the end of Spring 2019. Findings from the survey will be incorporated into the SMU Libraries strategic planning process currently underway. Questions? Email Zoltán Szentkirályi, SMU Libraries’ Director of Assessment at zoltan@smu.edu.